The consumer market has seen a dramatic uptake in wearable technology over recent years, and in the security market we are seeing a similar trend. Body-worn cameras are becoming must-have accessories for police forces the world over, with numerous studies showing their efficacy in reducing crime and unwanted conduct, both from the public and the police. Unfortunately, in South Africa these devices have not taken off as one would have hoped. Nevertheless, the potential of body-worn cameras is enormous and the market has reacted to this growing trend. Technavio is a market research company and it published a report into the ‘global wearable security devices market,’ and its results say that the market will see a compound annual growth rate of about 19% by 2021. Of course, as in all surveillance operations, the body-worn camera market does not only depend on the devices themselves, but also on the communications technologies, the storage, the mechanism for downloading and working with the video data, and most important of all, the people involved. 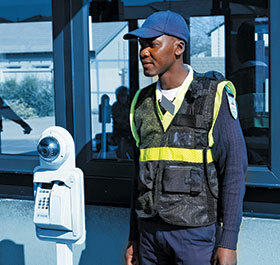 To find out more about these devices, Hi-Tech Security Solutions asked three body-worn manufacturers operating in South Africa for some insights into the market and what they offer. Reflecting the potential of the local body-worn market, two of the companies are local, producing their own devices and software, while the third is Kedacom, a Chinese company that recently launched in South Africa – with considerable fanfare. When focusing on the area of body-worn cameras, one must ask why this technology has not seen as much traction in South Africa, both in terms of public and private security services, as it has in America, Europe and Asia. Keith Lawrence, CEO of local designer Betatrac Telematic Solutions, admits it is taking a bit longer for local people and companies to accept that body-worn cameras are great products for assisting and supporting security service providers in gathering information. Moreover, he says that there are different body-worn models for different situations and those situations that warrant live video feeds can easily be catered for. Sam Zou from Kedacom (distributed in South Africa by Forbatt SA), says that while body-worn cameras are being adopted to record the process of law enforcement in the USA and Europe, providing evidence of whether police officials act within their boundaries, in SA the safety conditions are much worse and providing evidence afterwards is not the ultimate requirement. Yet, it’s not simply a matter of not wanting to use body-worn cameras or not seeing value in them. Kevin Croft from Body Cameras South Africa, another local player in this market, says that in his experience, both private security companies and government organisations are excited about the technology and clearly see the potential benefits, but are not yet ready to spend the money. • Evidence collection is far more cost-effective. • Protection for the public against rogue police officers and other security personnel. • Protection for security officers and police as it helps them justify their actions (such as the use of lethal force). • Procedure compliance as officers tend to follow procedures properly. One of the issues with body-worn cameras, and mobile security solutions in general is that the costs of transmitting video while on the move can be enormous. As noted above, some environments don’t require live streaming, but the benefit of these devices is that the wearer can push a button and alert a control room when something goes wrong. In these instances, the controllers need to see what is happening so they can react and send assistance or do whatever is required. Therefore, some form of live transmission is normally required, even if it does not entail continual live streaming. Zou adds that certain scenarios, like jails for example, would be ideal for Wi-Fi cameras. A WI-FI network offers good coverage in a restricted area such as this, meaning users don’t need to worry about the transmission issue. Kedacom also used H.264 to compress the video its body-worn cameras transmit and will be making use of H.265 in future, which promises even better compression without quality loss. Kedacom also provides an innovative technology called KWTP (Kedacom Wireless Transmission Protocol), which is able to dynamically adjust the frame rate, size and time gap of each packet. This makes wireless transmission more stable and smooth. Another issue many have with using body-worn cameras is that of theft and damage. These devices are a tempting target for thieves, while people wearing them may decide to drop them or damage them in some way to hide what they are up to. “All of our cameras are password protected and have built in memory,” says Croft. “This ensures that recorded footage cannot be erased from the device and users cannot ‘accidentally’ lose the memory cards. Our top of the range unit has a built-in GPS with live tracking and this enables control rooms to track the physical location of the camera. 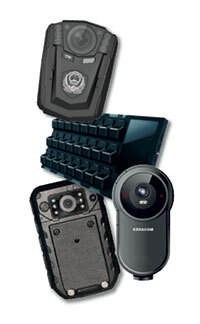 Kedacom’s cameras are also GPS enabled for real-time tracking. They are also designed to prevent accidental erasure of footage, and they are built to withstand a drop of up to two metres. Live streaming cameras generally have a GPS and some modules accommodate a panic button with supportive software to be able to monitor the location, adds Lawrence. This is obviously not required when live streaming is not used. Betatrac has developed a hybrid to overcome these shortfalls (more on this later). It’s all well and good to talk about the products and their benefits, but since body-worn devices are a fairly new idea in South Africa, the reality is that most companies looking at adopting these systems will already have some security solution in place. The ability to integrate the new body-worns with the existing infrastructure is a critical buying decision. If the system is not plug-and-play with existing equipment, there must at least be some way in which the body-worn data can be integrated with the other security information the company collects. Kedacom provides its own docking station and uploading solution that is easy to use and secure, however, Zou says it also provides standard compatibility through ONVIF or RTSP streams that can easily be directly integrated to other vendors’ systems. The company also provides its software development kit (SDK) for deeper integration. While the ins and outs of body-worn cameras is a subject we will no doubt be hearing about for many years to come, each of the companies represented here have their own solutions to offer the market. Body Cameras South Africa offers a range of products from an entry level camera through to a fully connected system. “All of our cameras have video and audio recording in various resolutions, infrared night vision and laser guided focus,” explains Croft. “Our entry-level model comes with a spare battery, while the more advanced cameras boast up to nine and ten hours of continuous recording time. For Betatrac, Lawrence says, “Our RapidCam-100 system is a historic playback via SD card solution. What makes our system so unique is by adding our eGuard Armband which utilises telematics over the GSM network. We have now created a unique hybrid solution with a real-time position update every 30 secs, plus the advantage of having a panic button, with all the audio and video data available upon manual download. Zou says that Kedacom has a range of solutions that cover the devices on the edge to the control room and servers. On the front end, apart from body-worn cameras, Kedacom also provides body-worn surveillance phones which allow companies to install versatile apps for surveillance monitoring. In addition, the company also provides ‘invisible cameras’ such as button cameras and ear-hook cameras for clandestine recording. In the mid-end, Kedacom provides a docking station for recording downloading recorded video and video management, while at the back-end the company provides a VMS for central management and storage. “The central management software is used for real-time management and communication among multiple persons, with snapshot and audio functionality available,” Zou says. “This equipment is deployed in a private network rather than public network, which makes the system safer. Refer to Hi-Tech Security Business Directory (www.hsbd.co.za) for further details on these companies.